Industrial ecologists have, to an increasing extent, been using materials (and substance) flow analyses to construct cycles of metals in defined geographical areas in order to get a better understanding of resource availability and long-term environmental change. Construction of well-quantified metal cycles would be very helpful in the design of sound policies related to production, consumption and recycling of metals and as a basis for decisions on a sustainable environmental policy. Examples of such recent attempts to construct metal cycles are those for Cu, Zn, Cr and Ni in Sweden, published in the previous monographs on metals and those made for greater Stockholm in the project "Metals in the Urban and Forest Environment". A comprehensive Cu cycle for Europe (the EU together with Poland) was recently worked out by a team of researchers from Yale University, Cottbus and Zürich. Their four reports, published in 2002 in "Ecological Economics", are reviewed and discussed below in some detail. In this work, efforts were made to incorporate all life stages and dissipative flows of Cu, meaning that both the recycling rates, the various waste flows and the dissipative flow rates have been estimated with greater accuracy than earlier and the new Cu cycle now covers a more relevant geographical region, i.e. Europe. • Most of the Cu used in Europe is mined, smelted and refined outside of the region, meaning that a net total of 1,900 kt of Cu was imported in 1994. • To supply the European Cu smelting industry, some 600 kt of Cu originated from ore mined within the region and 280 kt was contained in imported concentrates. • The output of non-alloyed Cu products is 2,650 kt/y, while the finished Cu alloy products amount at 780 kt/y (75% of Cu in finished products is in pure form). • Since about 920 kt/y of Cu enters the waste management system, the yearly increase of the stock of Cu in European society is about 2,500 kt (6 kg/capita, y). • Annual growth of waste Cu in landfills and tailings ponds is about 580 kt, which corresponds to a growth rate of 1.4 kg/capita. • Waste from electrical and electronic equipment is the fastest growing waste category (annual growth rate 5-10%); thus, here is a need for efficient recycling strategies. • The overall recycling efficiency for Cu in Europe is 48%, with relatively great variation between countries; thus, there is further potential for increased recycling efforts in the future. • Improved recycling of certain waste categories by applying appropriate technology is a much easier and quicker resource-saving measure than redesign of industrial and commercial products. • How much material enters the system? • How is the material transformed? • How much material escapes from the system to the environment? • How much material is added to the stock in use? • How much material is archived in landfills and other reservoirs? • How much material is recycled? • What trends exist in these flows and stocks? • studies by Stigliani et al. (1994) on cadmium in the Rhine basin and by Thomas and Spiro (1994) on the global lead cycle, both studies published in a book on "Industrial Ecology and Global Change" in 1994. In general, over the last ten years, there has been a growing interest in constructing cycles of metals in defined geographical areas, as the information provided by such exercises is considered useful as a background for the understanding of resource availability and long-term environmental change. It is obvious that the construction of well-quantified metal cycles will be needed if we are to form sound policies related to production, consumption and recycling of metals as well as for taking decisions regarding a sustainable environmental policy. Thus, there are a number of examples of more or less comprehensive metal cycles, such as the MFAs in the City of Stockholm, carried out as a part of the national Swedish research project "Metals in the Urban and Forest Environment" (see further details in sub-chapter 3.3 of this report), and the MFAs, covering the whole Swedish territory, for copper, zinc, chromium, nickel and molybdenum, which were reported in the three previous monographs (L & L - Zn, L & L - Cu, and EW - Cr,Ni,Mo). • To identify the stocks and flows of copper from extraction to end of life, in order to discover opportunities for increasing the efficiency of industrial copper utilisation. • To evaluate the magnitudes of dissipative flows to the environment. • To develop information for the consideration of resource policy and environmental policy initiatives (Graedel et al., 2002). This study is an important further development of the earlier copper cycles, e.g. of the one constructed for Sweden (L & L - Cu). 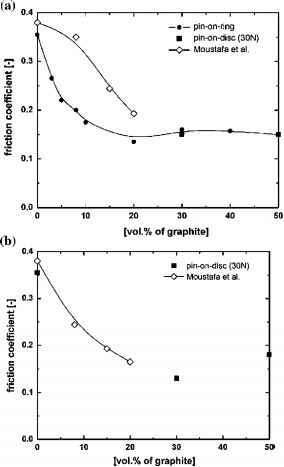 Both the recycling rates and the dissipative flows have now been estimated with greater accuracy, and the present cycles cover a more relevant geographical region, i.e. Europe. Therefore, the main results of the study will be summarised below. The goal of the study was to establish the copper cycle over 1 year in contemporary Europe while ensuring that >80% of the flows were captured. The year 1994 was chosen as the year of investigation. According to statistics published by the International Copper Study Group (ICSG, 1999), the 15 Member States of the EU together are responsible for about 90% of the European copper usage, but only for about 25% of the copper production. If Poland, the country having the highest copper production rate in Europe, is included, the system boundary covers 95% of Europe's refined copper usage and 80% of its copper production (Spatari et al., 2002). The chosen system boundaries also ensure that production waste such as slag and tailings, the stock of consumer products in private households and infrastructure, and consumer waste are included. Moreover, the definition is convenient because of the relatively good data availability at the level of the EU. In order to distinguish the system from the traditional definition of Europe, the system was designated as "STAF-Europe". 4. Waste management: recovery and recycling, landfilling, losses to the environment. The STAF-Europe system is connected to the external technospheres through import and export, and to the natural surroundings (the lithosphere and the biosphere). Reservoir is a compartment or group of compartments that contains the material of interest. Stock is the amount of material contained in the reservoir. Budget is the balance sheet of all inputs and outputs (the flows) to a reservoir. Cycle is a system of two or more connected reservoirs, where a large part of the material is transferred through the system in a cyclic fashion. Environmental reservoirs (wetlands, sediments, landfills) are usually treated as accumulative reservoirs, since geological recycling from these reservoirs only occurs on time scales longer than the span of human societies. The grade of copper ores that were mined and milled in the early years of the 20th century often was in the range 2-3.5%. However, most of the rich deposits of copper ores have been mined out. Thus, the grade of copper ore in a mining region may sometimes drop below that of gangue left from earlier mining. Today, several big mining companies exploit low-grade copper ores in open pits, some of them extract ore with a grade below 0.5% and even down to around 0.3%. Only in exceptional cases, ores currently being exploited have grades of >4% copper (which is the case for the sulphidic ores from the Storliden mine in northern Sweden), although the size of such rich ore deposits apparently is quite small. Due to the constant decrease in average grade of copper ores, increasing quantities of tailings (remnants from the concentration process) are being left at mill sites. Since the separation of the valuable mineral from the gangue is imperfect - and was even more imperfect in the beginning of the century - tailings contain copper. Tailings that were dumped by the year 1900 often had an average copper content of 0.75%, while those dumped by the end of the century had less than 0.1% copper. Thus, the improvements in milling methods since the early 20th century have roughly kept pace with the decrease in the grade of ore mined, i.e. the recovery ratio has changed relatively little in the last 80 years (Hancock and Pons, 1999). In the smelting process, the main loss of copper is with the slag. In the early years of the 20th century, smelter slag typically contained 0.35% copper, and the slag was discarded directly from the furnaces to nearby dumps. The adoption of flash smelting by the end of the century reduced energy consumption, but increased copper concentration in slag. In the 1990s, the copper levels in the slag usually were >0,5%. The ratio of slag discarded to the amount of metal produced depends on the copper content of the concentrate, and this ratio has been relatively constant, about 2.0 on average, during the 20th century (Graedel et al., 2002). Thus, the amount of copper being dumped on landfills together with the slag is not insignificant. Electrolytic refining generates copper cathodes (the main product), spent electrolyte and anode mud (the material that remains after the anodes are dissolved). Anode mud contains copper, selenium, tellurium and various precious metals, and is usually processed by roasting and leaching to recover these - often valuable - by-products (Graedel et al., 2002). Fabricators convert cathode copper into semi-finished products (shapes and ingots), which are shipped to manufacturers. Few of the semifinished products are ready for use as such, rather they go to first-stages manufacturers, who make metal rods and bars, wires and castings, and then to component manufacturers, who produce things like motors, valves and insulated cables. The components are incorporated by final-stage manufacturers into various finished products. Metal losses in fabrication and manufacturing become "prompt" scrap that is quickly recycled, mostly internally. Prompt scrap being formed during fabrication of semi-finished products is usually not included in the official statistics, while the prompt scrap being recycled from manufacturers back to fabrication is. Brass and other alloys tend to be recycled in alloy form rather than being reduced to the individual alloying metals. Overall, net losses to waste repositories from fabricators and manufacturers are generally regarded as negligible (Graedel et al., 2002). A great deal of thinking and discussion has been devoted to the problem of defining the various use categories of copper in the most convenient way to facilitate the copper cycle analysis. The proposal given by the Market Analysis Co., Birmingham, England (Joseph, 1999), includes 17 classes of copper-containing products, uses that accout for 79% of the worldwide consumption of copper, see Table 3.1. Table 3.1. Principal uses of copper in the world, in 1990 (Joseph, 1999, Graedel et al., 2002). Some of the estimates in Table 3.1 could be subjected to discussion. It should also be kept in mind that the distribution of copper uses given in the Table represents the situation in the year 1990. In some of the applications (e.g. in vehicles), there is, of course, a rapid development of the types and the relative importance of uses as well as of the life-times for the different uses. It is clearly necessary to take the great diversity into account when estimating copper stock in usage repositories. However, the classifications and the estimates presented in Table 3.1 seem to be quite useful for the establishment of a credible copper cycle for STAF-Europe. In order to characterize the in-use stock of copper, the authors (Graedel et al., 2002) have moved from the initial copper-containing products (Table 3.1) and produced a list of seven principal end uses with an indication of the typical amount of copper in each end use. Examples of such end uses are: automobile - 20 kg Cu; residential building - 200 kg Cu; per capita telecom - 4.0 kg Cu; and per capita electricity - 4.3 kg Cu. The typical copper content in commercial and industrial buildings and in industrial machinery is highly building and sector dependent and must be estimated from region to region or from industrial sector to sector. The in-use stocks were then estimated by setting suitable average copper contents for each of the proxy indicators, multiplying these factors by the quantity of proxy indicators within the region of interest and summing the results. Independent validation has been made where feasible (Graedel et al., 2002). An important aspect when analysing the buildup and decline of in-use stocks is, of course, a clear understanding of the distribution of service lifetimes of the various copper-containing products. Thus, it is important to estimate not only the total stock of copper, but also the age distribution for metal in service. Any metal older than the average service lifetime in a particular use will become available for reuse and recycling, but the actual reuse / recycling also depends on the physical form of the metal. An illustration of stock buildup and decline was given by Graedel et al. (2002) for copper building wire with an average lifetime of 45 years (range 35-55 years), with a yearly addition to stock of 10 copper units during the use period, and with total use period ending after 55 years. Building wire copper from stock put in place at the start of the period begins to become available for reuse or recycling after 35 years and the stock in service reaches steady-state after 45 years. After the copper building wire becomes obsolete, the stock gradually declines and disappears 55 years after the last installation (Table 3.2). Table 3.2. Example of stock buildup and decline for copper building wire (see text). In the project aiming at the establishment of the comtemporary European copper cycle, the waste management subsystem has been thoroughly studied in the third paper, by Bertram et al. (2002). The reader is referred to the original paper to get an account of the sources of the baseline data and of the various assumptions used in the calculations. In the present context, only a brief summary of the main results will be given. • Municipal solid waste (MSW), which shows a relatively low variation between countries, i.e. from 250 kg/cap., year in Austria to 680 kg/cap., year in Luxembourg, with an average of 400 kg/cap., year. • Construction and demolition waste (C&D), where the waste generation rate is much lower in sparsely populated countries, such as Sweden, Greece and Ireland (<200 kg/cap., year) than in countries with high population densities, e.g. Germany, the Netherlands and Luxembourg (725-750 kg/cap., year). Belgium to >30 kg in Denmark, partly reflecteing the percentage of the population served by sewage treatment facilities. • Hazardous waste (HW) generation varies a great deal from country to country with the lowest figure for the UK (41 kg/cap., year) and the highest for Luxembourg and Belgium (358 and 200 kg/cap., year). The average figure for STAF-Europe has been documented at the level of 90 kg/cap., year. • Industrial waste (IW) includes all wastes from industry and manufacturing that are non-hazardous. (However, it does not include the prompt metal scrap formed at the production units for semifinished products and goods.) The generation of IW ranges from 40 (Portugal) to about 1600 (Sweden) kg/cap., year, with an average of about 850 kg/cap., year. • Waste from electrical and electronic equipment (WEEE) is an important waste fraction in the copper cycle, but the real waste generation rate turned out to be very difficult to quantify, which was indicated by the wide gap between the theoretically expected generation rate of 14 kg/cap., year and the actual possible collection rate from private households (4-5 kg/cap., year). This suggests that a significant fraction of retired electronic products remains in "hibernation", i.e. they are not collected, but rather stored in households, in repair shops or circulate in second-hand markets. Due to this difficulty, an educated guess of the average generation rate, set at 7 kg/cap., year (for all countries except Poland), was used in the calculations. • End-of-life vehicles (ELV) was quantified as: ELV = □ Stock + New + Import - Export , where "□Stock" is previous year's vehicle stock minus actual vehicle stock; "New" is first registrations of vehicles; "Import" is imports of used vehicles and "Export" is export of used vehicles. With about 9.5 million passenger motor cars, about 1.4 million trucks and 20 000 buses and coaches being retired in 1994 in STAF-Europe, an average copper content of 2% in passenger cars and 0.5% in larger vehicles (trucks, buses), giving a weighted average of copper in cars, buses and trucks of 0.9%, the estimated total amount of copper in ELV for the year 1994 was about 240 kt. Table 3.3. Solid waste generation and copper content in the waste for STAF-Europe, in 1994 (after Bertram et al., 2002). As can be seen in Table 3.3, the estimated total amount of copper in post-consumer wastes in STAF-Europe in 1994 was about 920 kt. In addition, some 300 kt of copper in imported old scrap entered the waste management system. Roughly 60% of the copper scrap used in European secondary copper production comes from prompt manufacturing scrap (980 kt/year) and about 40% (740 kt/year) from old scrap. The 740 kt is made up of 300 kt imported and 440 kt domestic scrap. This means that about 48% of the domestically generated copper waste is recycled, while the remaining 52% is either landfilled (about 480 kt/year) or lost to the environment. Calculated on the total amount of post-consumer copper waste (1220 kt/year), the recycled fraction is more than 60%. The dominant part of copper scrap used in secondary production of copper is new or prompt scrap generated within the large fabrication and manufacturing base in Europe. Only about 26% of the scrap used in domestic secondary production comes from old non-imported scrap. About 55% of the copper scrap is re-melted directly by brass mills, wire rod producers, foundries and ingot producers, the remaining 45% goes back to the smelting and refining processes (Bertram et al., 2002). • WEEE is one of the most complex waste streams, and there is a general lack of adequate treatment facilities for this waste. Though mechanical separation standards make it possible to recycle 80-90% of WEEE, the cost of recycling most types of electronic equipment is higher than the value of the recovered metal (Langer, 1994). A significant proportion of WEEE in Europe is probably still disposed of as part of the municipal waste stream, stored in households or illegally dumped. However, increased efforts for recycling of WEEE have been initiated lately, and the recycling efficiency of copper in WEEE is currently supposed to be about 50%. In this context, it may be mentioned that the Swedish base metal producing company Boliden AB recently considerably increased its use of WEEE as a raw material in the secondary production of copper (Sundberg, pers. comm.). • ELVs have a great potential as a secondary copper resource. According to a study by Frei et al. (1993) of vehicle scrapping plants, only about 40% of the copper contained in automobiles reached the scrap market in the early 1990s. Later on, Russo et al. (1999) found that dismantling steps prior to shredding make it possible to separate 90% of the copper in ELV during the disposal procedures. Currently, it is assumed that 70% of the copper in the ELV stream is recovered and recycled (Bertram et al., 2002). According to a recent EU Directive, 85% of a scrapped automobile should be reused or recycled, before January 1st, 2006. • C&D recycling was examined in an EU study (1999), and it was found that recycling and reuse of C&D varied from <5% in some countries (e.g. Spain, Portugal, Greece and Ireland) to 90% for others (the Netherlands), resulting in a weighted average of 28% for Europe. However, most of the countries with poor recycling infrastructures have an active informal recycling industry, based on hand collection of all items with an economic value (e.g. copper tubes) before the C&D is landfilled. Other studies (e.g. Brunner and Stampfli, 1993) have shown that up to 69% of copper leaves a waste sorting plant with the metal fraction, which can theoretically be recycled. About 50% of the copper was separated by hand sorting. Based on the different information sources available, Bertram et al. (2002) concluded that the recycling efficiency for copper in C&D in Europe would be between 30 and 50%. • About 2 kg per capita of copper waste is generated annually in the region. • WEEE and ELV are the two domestic waste streams with the highest copper content; they contain 67% of the total copper throughput, but only make up 4% of the total waste mass. • WEEE is the fastest growing waste category (annual growth rate of 5-10%), a fact that emphasizes the need for efficient WEEE recycling strategies. • Overall recycling efficiency in the region for copper in all types of waste (excluding prompt scrap and scrap imports) is 48%, with a range of 5-58% depending on the country. • Consequently, there is further potential for increased recycling activities in the future. • For example, it is possible that separate collection and mechanical dismantling of WEEE is superior to a system where consumer appliances and MSW are collected together and sent to an incinerator with adjacent recovery of copper from the bottom ash. • Although the copper content of MSW, SS, IW and HW is small and their relevance for copper recovery is not significant, efforts should be made to reduce the loss of copper via these waste categories. • The distribution pattern of copper in the waste management system shows that high recovery rates are theoretically possible by applying appropriate technology to selected waste streams. • In general terms, it is much easier and quicker to undertake such changes, rather than introducing structural changes such as the redesign of industrial and commercial products. The second paper in the series dealing with the contemporary European copper cycle proposes a complete copper cycle for STAF-Europe (Spatari et al., 2002). production, fabrication / manufacturing and waste management, in order to determine copper flows as well as the amounts of metal that enters use in society and is deposited in waste repositories. The majority of copper used in the region is mined, smelted and refined outside of Europe, meaning that a net total of 1,900 kt of copper was imported into Europe in 1994. To supply the copper smelting industry in STAF-Europe, about 600 kt of copper originated from ore mined within the region (690 kt of copper in the concentrates and 90 kt in the tailings, which go to landfilling) and 280 kt contained in imported concentrates. About 12 kt copper in smelter slag was deposited in landfills. Refineries are supplied with copper from the smelters, but to a large extent also with imported blister copper and with post-consumer, old scrap as well as with new scrap from the fabrication / manufacturing sector. Also the latter sector takes a considerable share of its raw material (cathode copper) from imports (about 1,300 kt/year), while cathod copper from domestic smelters accounts for some 2,300 kt/year, and recycled old scrap for about 200 kt/year. 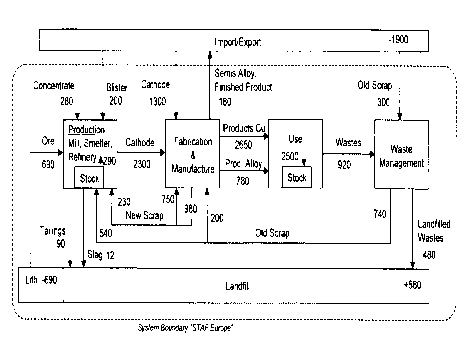 In addition, there are significant internal loops of scrap, e.g. between the manufacturing and fabrication operations. The output of non-alloyed copper products is to a dominant part used domestically (2,650 kt/year), since only about 70 kt/year is exported. As far as the finished copper alloy products are concerned, about 88% are used domestically (780 kt/year). Thus, the majority of copper in finished products is contained in pure form (75%). Since the amount of copper entering the waste management system is about 920 kt/year (see 3.1.4), the rate of yearly increase of the stock of copper in European society is about 2,500 kt (2,650 + 780 - 920 ~ 2,500 kt). Calculated on a per capita basis, the net addition of copper to the stock in society in the region is 6 kg/year (Spatari et al., 2002). The amount of metal in waste repositories - landfills, including tailings ponds - also grows by a yearly rate of about 580 kt, corresponding to a growth rate of 1.4 kg/capita. The information from the different steps in the copper cycle was then integrated to provide a comprehensive continental-level copper cycle (see Figure 3:1).